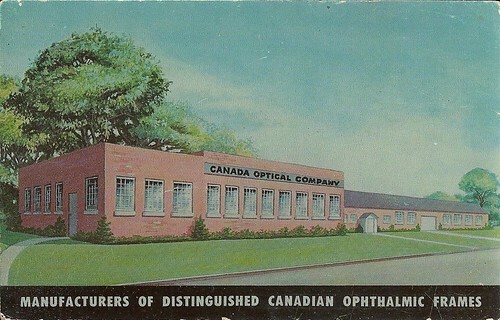 The Canada Optical Company (originally called Canada Zyl Company) operated a factory in Deseronto, Ontario from 1946 to 1996, manufacturing frames for glasses. In 1996 the factory operations were moved to a building on the airport of the Tyendinaga Mohawk Territory. It closed down in 2002. Collection of materials relating to the Canada Optical Company in Deseronto, Ontario, including photographs, promotional materials, newspaper and magazine articles and summary of employee benefits. The materials were collected by Don Simpson, former general manager of the Deseronto plant. Materials donated by Don Simpson in April 2015.